Product categories of Machining Parts, we are specialized manufacturers from China, Cnc Machining Parts, Precision Turned Parts suppliers/factory, wholesale high-quality products of Precision Machine Parts R & D and manufacturing, we have the perfect after-sales service and technical support. Look forward to your cooperation! Machining is a part of the manufacture of many metal products, but it can also be used on materials such as wood, plastic, ceramic, and composites. A person who specializes in machining is called a machinist. A room, building, or company where machining is done is called a machine shop. Machining can be a business, a hobby, or both. Much of modern day machining is carried out by computer numerical control (CNC), in which computers are used to control the movement and operation of the mills, lathes, and other cutting machines. 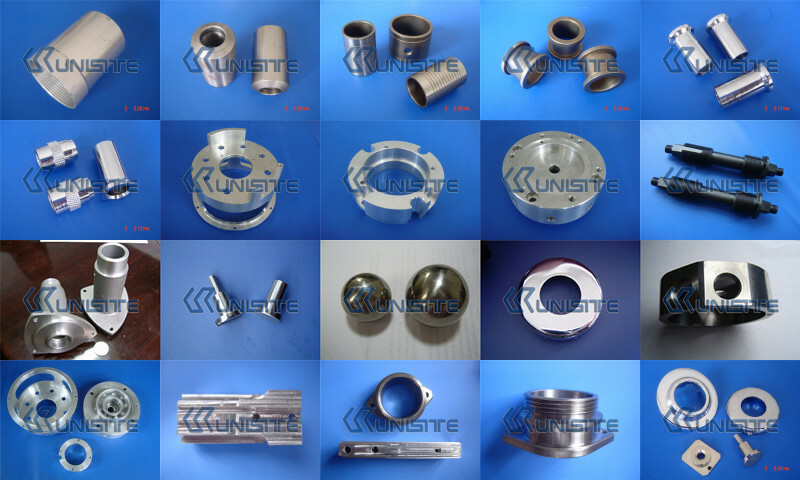 We UniSite Group have involved in this field for many years,pls see follow photos of related products. Machining/Machining are two main types of manual processing and nc Machining. Manual processing is to point to by mechanical workers manual Milling Machine, lathe, drilling machine and the sawing machine and other mechanical equipment to implement various materials for processing. Manual processing and suitable for small batch production, simple parts. CNC Machining (CNC) refers to the mechanical workers use numerical control equipment to carry on the processing, the CNC equipment including machining center, turning center, wire cutting equipment, thread cutting machine, etc. The vast majority of the machining shop all the nc machining technology. Through programming, the workpiece coordinates in the cartesian coordinate system (X, Y, Z) into a programming language, numerical control machine tool CNC controller by identifying and explain programming language to control the axis of nc machine tools, automatic removal of material, according to the requirement and finish machining workpiece is obtained. CNC machining in a way that is straight artifacts, suitable for mass and complex shape parts.